Tooth loss may be common, but it is nothing to take lightly. The majority of people over the age of 35 are missing at least one tooth, according to some estimates -- and the effects of tooth loss can be significant if a sturdy replacement is not achieved. Fortunately, dental implants in Ocala are available for quality single-tooth replacement. By rebuilding the tooth from the root up, dental implants provide a natural, whole-tooth solution for a missing tooth that is unlike any other option currently available. Keep reading to learn more about dental implants and how they can help you enjoy a complete smile for life! 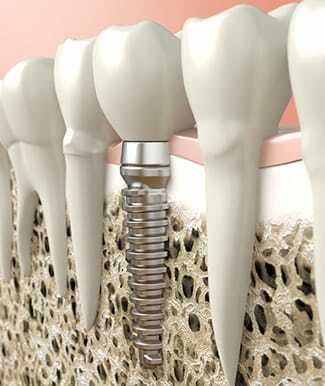 A dental implant is a small titanium post that acts as a prosthetic tooth root. It can be implanted beneath the gum line in the area where a missing tooth’s supportive structure was. Once here, the titanium material promotes the growth of bone tissue to help the post fuse together with the jaw bone, providing unsurpassed stability for the crown that is then affixed on top. Many adults are eligible for tooth replacement with dental implants. Dental implant procedures can be broken up into two major phases: placement and restoration. First, Dr. Weldon will evaluate your jaw to determine whether or not it is strong enough for the proper anchoring of the implant post. If adequate bone tissue is not present, a bone graft may be recommended first. Once the oral environment is right, the implantation can occur. This is a surgical procedure completed with extreme care and expertise by Dr. Weldon. After the implant post has been placed in the jaw, healing begins and will take place over the course of 4 to 6 months. This is the time when osseointegration, or the fusion between the jaw and implant post, takes place. You may wear a temporary tooth replacement if needed. After the implant post is secure in the jaw, you return to our office for the second part of the procedure -- final restoration. First, the top of the implant is exposed and a connecting abutment is placed. After one more brief healing period, the dental crown is affixed on top of the abutment. And that’s it! An implant stabilizes the jaw bone to promote better oral health. By keeping the bone healthy, the risk of further tooth loss is reduced. Implants promote a balanced and nutritious diet. Speech may be clearer with dental implants. When cared for properly, a dental implant can stay healthy for a lifetime. Dental implants are a wonderful restorative dentistry option for patients who have lost a single tooth. Do not wait to find out whether or not you are a candidate for this comprehensive tooth replacement! We can’t wait to help you achieve a healthy, complete smile. Go ahead and contact us today.